Antioxidants are vital to help combat the damaging effects of free radicals and protect our skin and bodies cells. Free radical damage is caused by the effects of the suns harmful rays, pollution, cigarette smoke, unhealthy diets, medications and other external environmental factors. We consume antioxidants through certain foods but our skin also needs extra protection via topical applications as the skin is often the last to receive the benefits of antioxidants consumed orally. Natural, healthy cells are surrounded by pairs of electrons. When the bond between electrons deteriorates and the electrons split, the unstable electron starts searching for a new molecule to steal and attach itself to in order to regain stability. This results in a chain reaction and as we age the damage can accumulate and become irreparable. Antioxidants act as scavengers, by sharing their electrons with unstable molecules and help stop further oxidation and damage to tissues and DNA at a cellular level. Our bodies require a daily supply of antioxidants internally and externally to maintain healthy cell function. Studies have shown that antioxidants can help to slow the ageing process and antioxidants absorbed through food can help to fight disease and regenerate cells. 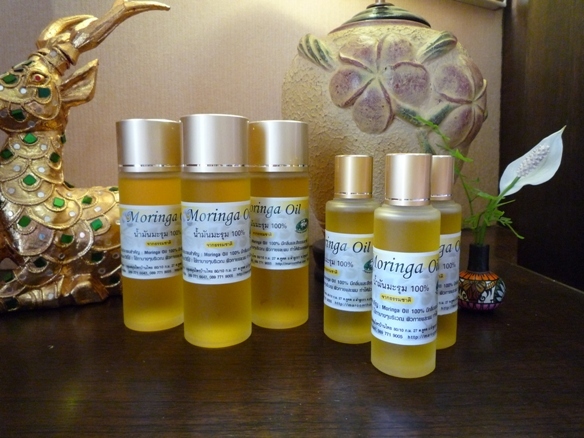 Moringa oil has exceptional anti ageing properties. The antioxidants and the nutrients present in the Moringa oil help to curb the activity of the free radicals on the skin. The free radicals are the agents that cause damage to the skin tissues and pave way for skin wrinkles. 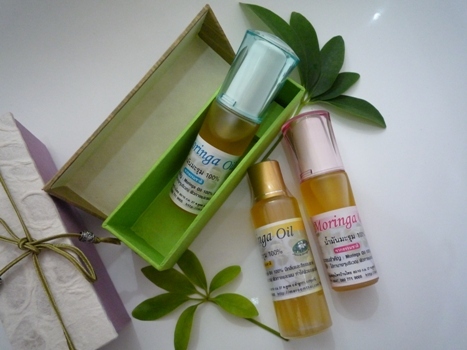 Antioxidants rich Moringa Oil, curbs the activities of free radicals and hence finds a place in the anti ageing creams. Moringa oil can be used in creams, lotions, balms, scrubs, body oils, and hair care formulations at the ratio of 3-100%. It also has nourishing and emollient properties giving it benefits for use in skin and hair care products. Moringa oil, as olive oil is useful in lifting dirt out of the hair and is an efficient natural cleanser. Good antioxidant properties, considered to be the factor behind its remarkable stability. By simply wetting the hair, massaging the oil into the scalp and rinsing can effectively clean and moisturize the scalp. It has nourishing and emollient properties, making it an excellent Massage Oil, which leaves the skin with a silky feeling. Rich in Palmitoleic, Oleic and Linoleic acids, Vitamins A and C and unsaturated fatty acid, Moringa oil has excellent moisturising and nourishing qualities. Moringa oil blends easily with essential oils and this combined with its non-drying quality and its ease of dispensability on the skin makes it as perfect massage oil. Helps clears black heads & spots. Helps to tighten the skin pores. Keeps skin healthy and glowing. There are reports of moringa being used in cosmetic preparations as far back as 1400 BC, wherein an allegedly successful remedy to treat wrinkles consisted of: gum of frankincense wax; fresh moringa oil ; Cyprus grass. The mixture was ground finely, mixed with fermented plant juice, and applied daily. This oil is known as the most stable natural oil, which is a good source of behenic acid and is used as a preservative in food industries. It is an excellent salad oil. The Moringa oil has Odorless to mild nutty flavour. It is also used as vegetable cooking oil. Due to its high quantities of Oleic Acids (Mono-Unsaturated Fatty Acid) is good for sautéing and deep frying. 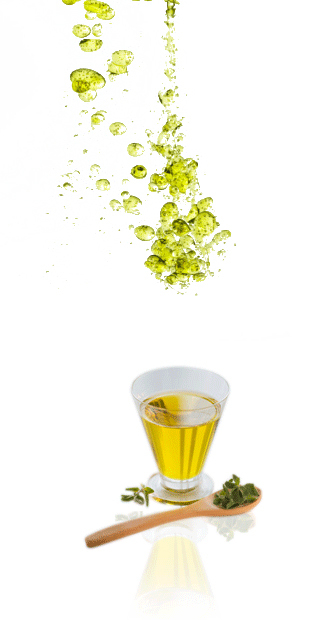 The bright yellow oil with a pleasant taste has been compared in quality with olive oil. It can also be used in dressings. (Smoke point unknown). The Moringa oil is clear, sweet and odorless, never becoming rancid. Cold processing method is used to extract oil from moringa seeds. Known as the most stable natural oil, it is a good source of Behenic acid in nature and is used as a preservative in food industries. The oil is obtained by cold pressing method. The oil is liquid at ambient temperature, translucent and pale yellow in color. Size 1,000 ml.bottle only 8,000 Baht !